The Biology of Forced Displacement – Patrick F. Clarkin, Ph.D.
Of course, the life of a refugee does not begin after crossing a border or resettlement. I was also interested in their lives before French Guiana, and how they had gotten there, and whether the war years had affected their physical growth and health. Some people had lived in France for a few years, while others came directly from refugee camps in Thailand. However, nearly all of the adults I had interviewed – in French Guiana as well as their Hmong and Lao counterparts in the US – were born in Laos during the Second Indochina War. History shows that the war was very hard on civilians, with many people being killed or injured. Others were displaced by the conflict, some several times, forcing people to make long arduous journeys on foot for up to hundreds of miles. One 37 year-old Hmong man revealed that he was displaced six times by the war, all before age 15. He was able to name each place he was forced to leave, and I estimated that these various journeys totaled at least 170 miles, as the crow flies. 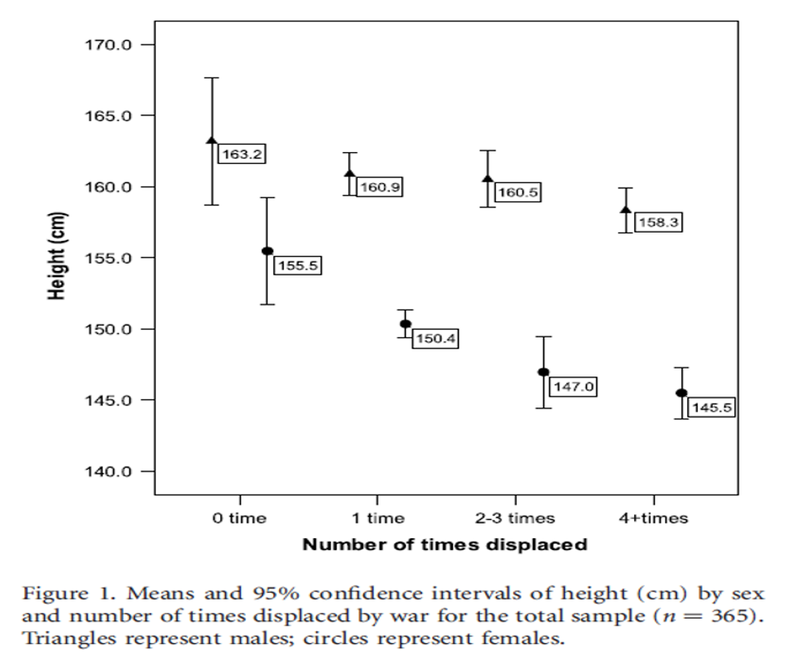 For the sample overall, the more times a person was displaced – most of which occurred during childhood or adolescence when they were still growing – the shorter they tended to be as adults (Clarkin 2012). This was an imperfect correlation, as not all displacement events are equivalent (such as the duration or difficulty of the journey, age at which displacement occurred, level of security in place of refuge, etc.). However, it makes sense that children growing in an environment disrupted by war would not grow as well as they would in a more stable place. In a real sense, the experiences of war had become embodied in Hmong and Lao children, remaining there until adulthood. Similar patterns probably occur in most wars. Height, by the number of times Hmong and Lao adults were displaced during the war in Laos (from Clarkin 2012). To uproot a single life is no small thing. To uproot thousands, or even millions, can be devastating. By now, it can be easy to lose track (and feel overwhelmed by) the staggering numbers of displaced people around the world. Rwandans crossing into Ngara, Tanzania, April 1994. Source: UNHCR. Asylum seekers from Africa traveling by boat on the Mediterranean, June 7, 2014. (Source: Massimo Sestini—Polaris). Iraqis fleeing by car outside the city of Arbil, the capital of the autonomous Kurdish region. June 10, 2014. Source: Der Spiegel. An ethnic Albanian woman feeds her baby as she and another 2,000 refugees flee Kosovo on March 30, 1999. Source: NATO. 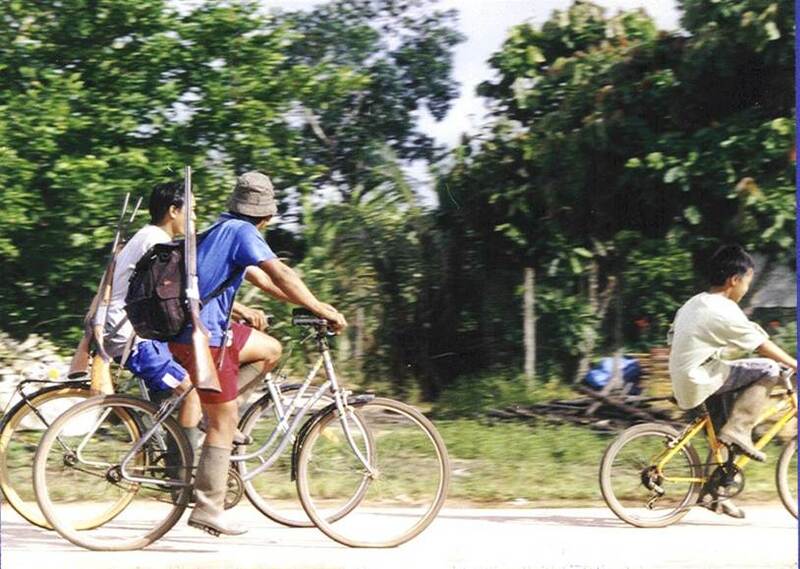 Displaced Hmong from Laos, walking to a refugee camp in Thailand. Source: Roger Warner, 1998. Kurdish refugees travel by truck, Turkey, 1991. Source: wikipedia. Central Americans headed north by train (“El bestia”), hoping to make it to the United States. Source: NPR. John Moore/Getty Images. Still, numbers rarely do justice to actual lived experiences. All displaced people are unique, but what they have in common is that forced displacement is invariably disruptive to normal life. In one sense, refugees are the lucky ones because they are the survivors. But the search for sanctuary from conflict often comes at a severe cost, and there is no place like home. Forced displacement – whether it be among asylum seekers, refugees who cross an international border, or internally displaced persons (IDPs) – can be harmful to health for many reasons. Lost resources. The loss of property, capital, family, and social networks further exacerbates the ability of displaced persons to acquire food and other resources, particularly for children separated from their parents. Broken crop cycles. For people from subsistence economies, agricultural cycles broken by war means that it could take months to grow new crops to fruition. In April, UNICEF warned that fighting in South Sudan could affect the planting season, and that the likely missing harvest could mean that “we will see child malnutrition on a scale never before experienced here.” Those warnings now appear prescient. Resettlement areas are unfertile or less productive. Upon reaching safety, displaced persons often end up in areas that are less economically unproductive, or even desolate, compared with their former homes. For example, 87% of villagers evacuated from Quang Tri Province to a resettlement area near Cam Lo during the Vietnam War said their situation was worse than it was in the war zone (Turse 2013, p. 67). Malnutrition. In many instances, displaced children face high rates of malnutrition. An estimated 21% of children displaced by conflict near Zamboanga City in the Philippines were malnourished, while 40% of children from the Central African Republic who fled to Cameroon were. For reference, humanitarian organizations consider malnutrition rates of 10-14.9% to be ‘serious,’ while more than 15% is considered ‘critical’ (cedat). Displaced mothers who themselves face nutritional stress may be unable to provide milk for their infants, or even give birth to low birth weight newborns. One woman from CAR who made a three-month trek to get to Chad told UNHCR that: “I gave birth to my daughter in the bush, in the middle of the forest. I had nothing to eat and so I had no more milk.” [Note: a photoessay of the state of children in Cameroon can be found here]. Sexual violence. Refugees are often vulnerable, if not defenseless, and prone to sexual violence (Morgos et al 2007). Infection. Refugees may be placed in crowded, unsanitary conditions that may facilitate the spread of diarrheal and respiratory disease (Yip and Sharp 1993). Viewed as burdens. International refugees or asylum seekers are often seen as burdens by host nations. In developing countries, competition between locals and newly arrived displaced people can create tensions. Even in high income countries, such as Australia, there has been resistance to people seeking asylum. In the U.S., a recent influx of people, particularly children, from Central America (El Salvador, Guatemala, and Honduras) has created tensions. Some of this has revolved around whether the children are legitimate asylum seekers. A UNHCR study found that 58% of the children interviewed were fleeing extreme violence, qualifying them for asylum. To further support that case, the number of asylum seekers fleeing to other stable Latin American countries, such as Mexico, Panama, Nicaragua, Costa Rica and Belize had increased 432%. In other words, the increase of people entering the United States is not unique and does not seem to be merely a matter of economic opportunism, but a sign of desperation. 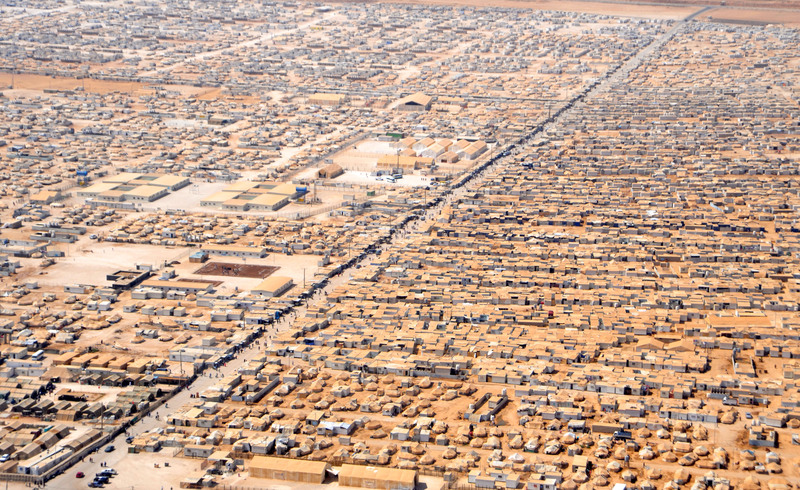 Zaatari camp (Jordan) for Syrian refugees. Source: wiki commons. It would be misleading to say that the effects of forced displacement are consistent across the board. Sometimes it is the least bad option available, so circumstances certainly matter. In one study of children in Baghdad, those who left home because of violence were not more likely to be malnourished, but those who lived in an insecure area, or who had a family member killed in the last five years, were (Ghazi et al 2013). On the other hand, internally displaced children in Afghanistan and Myanmar were significantly more likely to be malnourished than their non-displaced counterparts or those who became international refugees and were able to find humanitarian aid and more secure living conditions (Mashal et al 2008; Mullany et al 2007). In addition to its possible impacts on physical growth, forced displacement may have long-term impacts on health in other ways, though more research is needed. Finnish children who were evacuated to foster homes abroad during WW2 showed higher rates of cardiovascular disease and type 2 diabetes as adults 60 years later, pointing to the role of traumatic separation (Alastalo et al 2009). Another study from WW2 found that elderly Germans who had been displaced had higher levels of anxiety and lower levels of resilience and life satisfaction (Kuwert et al 2009). Therefore, at least in some cases, forced displacement can have severe, lasting effects. Displacement is not just a temporary inconvenience; rather, it has the potential to adversely affect health for decades. Yip R, Sharp TW. 1993. Acute malnutrition and high childhood mortality related to diarrhea: lessons from the 1991 Kurdish refugee crisis. JAMA 270:587–590. This entry was posted in DOHaD, Fetal origins, Global Health, Hmong, Human biology, Human growth, Laos, Nutrition, Refugees, Southeast Asian, Trauma, Uncategorized, Vietnam, War and health and tagged Afghanistan, Forced displacement, Iraq, Syria. Bookmark the permalink. powerful stuff Patrick. Hard not to globalize it and think that we are just plain overcrowded on this planet, or maybe that modern weaponry has made a sort of inequality, made it to easy for the armed to their killing with less personal risk than in the ancient world where anyone could fight back with rocks and sticks . . .
apologies for grammar: ” . . . too easy . . . ” as well as other horrible stuff. I’m sleepy. No worries on the grammar. I think the point about overcrowding and population pressure could play into competition and conflict, but I’m not sure how large a role it plays. Jacob Bercovitch and Judith Fretter once looked at 343 wars from 1945 to 2003, and reported the leading “core conflict issue” was security (28%), territory (23%), ethnicity (22%), ideology (18%), independence (7%), and resources (2%). To be realistic, I don’t know how many wars can really be attributed to single causes. Whatever the cause, though, it brings lots of damage. Jacob Bercovitch and Judith Fretter. 2004. Regional Guide to International Conflict and Management from 1945 to 2003. Washington, DC: CQ Press. Pingback: Growth of Recently Arrived Refugee Children in the U.S. – Patrick F. Clarkin, Ph.D.